Enid Wonnacott has tallied many accomplishments over 30-plus years as executive director of the Northeast Organic Farming Association of Vermont. In 1987, her 10-hour-per-week job came with one filing cabinet and a milk crate filled with paperwork. Since then, Wonnacott has built the nonprofit into a 20-person team supported by a $2.8 million budget. NOFA-VT has had an impact not only on Vermont agriculture but nationwide. Wonnacott started at the association the same year that Sen. Patrick Leahy (D-Vt.) became chair of the Senate agriculture committee. The two worked closely on developing the National Organic Program, which eventually led to the creation of the U.S. Department of Agriculture organic seal in 2002. "Enid has been one of the most effective advocates for organic agriculture in the entire country," Leahy told Seven Days via email, acknowledging that the road was long and that challenges continue. "Through all of this, as a leader, Enid has been patient but persistent and always a clear-eyed problem solver. I have often looked for Enid's help on difficult policy challenges," Leahy added, "and she has never been reluctant to let me know exactly what needs doing to support and strengthen organic agriculture." This summer Wonnacott, now 57, was inducted into the Vermont Agricultural Hall of Fame. In early October, she announced that she was stepping down from her position earlier than planned due to cancer. The hall of fame acknowledgment is notable, said Chuck Ross, director of University of Vermont Extension and Vermont's former agriculture secretary, who cohosted the awards event. While a few previous honorees contributed to the organic movement, Wonnacott is the first to be exclusively affiliated with organic agriculture. "This is recognition of her role as guardian and voice of the organic movement," Ross said. "It also recognizes the evolution of organic as a significant and meaningful part of our economy in Vermont and the economy nationally." Under Wonnacott's guidance, NOFA-VT has become the go-to resource for organic farmers and gardeners, agricultural advocates, and locavores for everything from technical production assistance to comprehensive lists of farmers markets and CSAs. There were fewer than 50 organic producers in 1987; now NOFA-VT certifies more than 700. Its robust farm-to-school partnership, subsidized farm shares and other efforts work to broaden access to local and organic food. 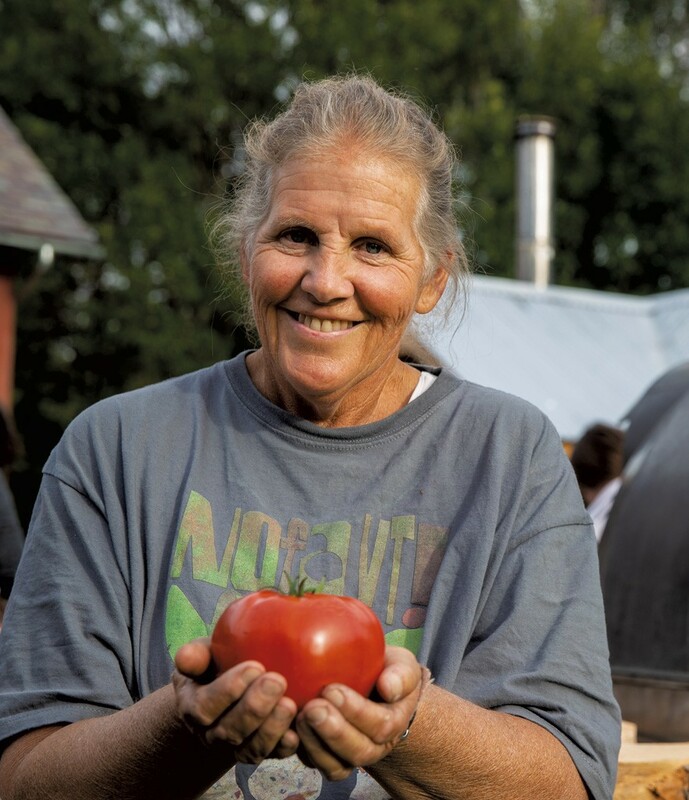 The nonprofit's mobile pizza oven, though, is probably the most vivid symbol of Wonnacott's unique contributions: She embodies the warm heart of Vermont's organic agriculture movement, pulling community together around organic food and the farmers who produce it. 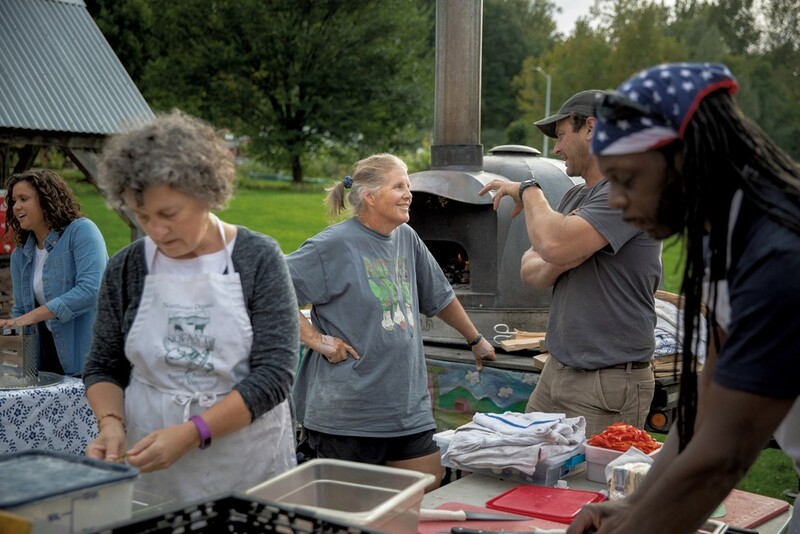 "I love that whole program and initiative as much as anything we do," Wonnacott said, after smoothly maneuvering the oven into Burlington's Intervale on a September afternoon. Later that day, she headed up a team of volunteers and Intervale Center employees to bake pizzas for an event, hands in the dough, laughing and hugging longtime friends who stopped by. Launched in 2006, the portable pizza oven fulfilled a vision Wonnacott had for gathering people around food in a way that fostered connection and conversation. "I'm passionate about community building," she explained. "I think people need and seek community." Particularly in the early days, freshly baked pizza helped raise NOFA-VT's profile with consumers and farmers. The copper-domed, wood-fired oven on a trailer has logged thousands of miles and produced thousands of pizzas at events such as farmers markets and young-farmer socials. Since Wonnacott's cancer diagnosis in 2014, working the oven has also provided a personal benefit. "It's such a physical, present thing to do, especially when you have chemo brain," she said. "To get out and see people is a really healthy thing for me." People who have worked with Wonnacott say her positive energy and balanced approach have been both anchor and beacon through the hard work of building a movement. Mara Hearst, now a sheep farmer in Dorset, was 19 when she first met Wonnacott, who invited her to become a student representative on the NOFA-VT board. Hearst said Wonnacott's consistent message as a leader and mentor has been: "We need to make change, and there's a shitload to do, but let's take time to be a community together." "After hours, she's the first one to turn on the music and get everyone dancing," said NOFA-NY board member Elizabeth Henderson. When she was founding president of NOFA-Mass., Henderson was on the committee that originally hired Wonnacott for the Vermont chapter. "It's one of the things I'm proudest of," she said. The agricultural landscape has changed dramatically since Wonnacott became the nonprofit's third executive director at age 26, fresh out of graduate school. According to the Organic Trade Association, organic food sales in the U.S. hit $45.2 billion in 2017 and accounted for 5.5 percent of all food sold. Twenty years ago, OTA's first published sales figure was $3.4 billion. The USDA National Organic Program helped propel growth. However, its integrity has been questioned over the past couple of years based on media coverage of probable standards noncompliance by large organic dairy and egg operations. Investigation also revealed that some organic imports were receiving fraudulent certifications. Then the USDA withdrew approved, strengthened organic animal-welfare standards, though they had not yet been enforced. After her initial diagnosis but before her cancer spread, Wonnacott had planned to retire in 2021, when NOFA-VT will turn 50. "But it's also a good time now," she said. "I recognize there are a lot of changes to the organic industry, challenges to organic integrity. I think there's a need for really strong leadership, someone who has the energy I had when I started." After a pause she added, "I don't have the fight anymore, just my love and appreciation for this movement. I want it to be shepherded by somebody with a lot of health and energy right now." Wonnacott's deep passion for agriculture was seeded while growing up on her family's Weybridge homestead. Her mother was dean of students at Middlebury College. Her father died of cancer when Wonnacott, the youngest of three sisters, was 16. She spent a lot of time on a neighboring dairy farm, showed livestock at the fair and worked with a large-animal veterinarian. At St. Lawrence University in New York State, Wonnacott studied biology and chemistry and first learned about organic agriculture. She relief-milked for a nearby organic dairy and read Wendell Berry's 1977 classic, The Unsettling of America: Culture & Agriculture. "You know when you read a book and you're like, Oh, my God. This is what's in my head," she recalled. During a semester in Kenya, Wonnacott learned how to treat cobra bites and hand-milk a 70-cow herd. Kenyan agriculture was organic "by default," she said. "There was money to supply inputs, but no one knew what to do with them. I saw huge piles of imported chemical fertilizer next to broken-down tractors." As graduation neared, Wonnacott applied to veterinary school and, at her mother's suggestion, for a yearlong Thomas J. Watson Fellowship to study alternative agriculture. "My mom was a really strong role model as far as 'women can do anything,'" Wonnacott said. "She supported what was in my heart." She won the fellowship and worked on organic farms in New Zealand, Nepal, Norway and England; the experience was pivotal. "It was an agricultural system that made common sense to me, a culture of preventative management and health for the soil, the plants and the animals," Wonnacott said. "I wanted to know, Why does the world not farm this way?" Back in the U.S., she taught biology and environmental education and became an organic certification inspector before pursuing graduate studies at UVM. "I had to figure out why the world works the way it does," she said. "How does our agriculture policy influence other countries? How do supply, demand and financial systems work?" For her thesis, Wonnacott interviewed organic farmers about the role of policy in effecting change. "In the end, I felt like it's all about grassroots — that was where change was going to come from," she said. When Wonnacott landed the job at NOFA-VT shortly after finishing school, she built on her thesis contacts to launch that grassroots effort. In the mid-'80s, Wonnacott recalled, "organic was really the underground." Farmers told her they didn't label produce organic because customers would assume it had worms. "People thought it was just hippies playing around," she said. "It wasn't respected." Her goal, Wonnacott said, was to raise the status of the movement and provide support to farmers in the pre-internet age. She also prioritized developing a farmer-driven organic certification program with lengthy discussions to hash out standards. "For me, fascinated by movement building, by how groups make decisions, these were really amazing meetings," Wonnacott said. Jack Lazor of Butterworks Farm in Westfield met Wonnacott when she was a graduate student and worked helping to deliver the farm's yogurt to stores. He was part of the first community forum she later led in her new NOFA-VT role. "She did it all at the beginning," Lazor said. "She built this thing up through goodwill and positive forces. She's a force, but a gentle force." At the time, organic standards were not consistent state to state, and Wonnacott soon found herself at the center of a sea change. Organic was growing rapidly, she recalled: "Sen. Leahy came to me. There was a lot of interest from California to create a level playing field for interstate trade. He wanted to know, 'What does Vermont think of this?'" Wonnacott and other organic pioneers were both nervous and hopeful about federal involvement. "It's hard when you've been an underdog not to be totally wowed by the attention and money for research and organic support," she said. It soon became clear, she said, that a national organic program "was going to move forward with or without us and we had to put our energy into making it the best it could be." Pragmatism is a Wonnacott hallmark, according to Megan Camp, vice president and program director at Shelburne Farms. The two women served together on a statewide council alongside diverse agriculture community representatives. Tension would occasionally arise, Camp acknowledged: "Some people would pound the table, point fingers. Enid would make the same argument firmly, but always listening, able to hear multiple perspectives." Wonnacott believes strongly that it doesn't help to label types of farming as "good" or "bad." But she recognizes that her approach has disappointed some. "We're a really inclusive organization, and that's been really important to me," she said. "We want to move all farmers along the sustainability spectrum, never be organic elitist, never say this is the only way you can farm. "It's been a conflict for some staff and some board members over the years, absolutely," Wonnacott continued. This was particularly evident when the local food movement gathered momentum, sometimes at the expense of organic. "Our tagline has been, 'Certified organic, locally grown' — you don't have to choose," she said. But in practice, consumers and farmers set their own priorities. For example, Wonnacott explained, if one local farmer sells eggs from free-range hens but also feeds them GMO grain and customers think that's good enough, how can the local organic farmer charge the premium price that's needed to cover expensive, non-GMO grain? Wonnacott is playing the long game. She believes that collaboration and mutual support are critical to sustaining agriculture in Vermont and nudging more farmers toward organic practices. "I believe we can be both a movement builder and a bridge builder," she said. "It's allowed us to be at the table for a lot of really important conversations, and I think it was pivotal in my hall of fame award." Andy Jones, manager of Burlington's Intervale Community Farm and former NOFA-VT board president, believes "the big tent" has served the agricultural community well. Early on, he noted, Wonnacott saw the benefit of offering technical assistance to conventional dairies that were exploring a transition to organic. She recognized that farm-to-school programs could provide markets for local and organic farmers and also teach new generations to appreciate the food. "She always wanted to build the answer" to any problem, said Jones. She sought "ways to build the ag community, the rural community. She knows Vermont is stronger when everyone is successful." Wonnacott understands that her successor will face challenges. NOFA-VT membership is stagnant at about 1,200 members, and this year's winter conference attendance was down across NOFA state chapters. The USDA organic integrity issues have provoked fractures within the organic community, along with public confusion and distrust. "I fear for the future of organic, the splintering that's taking place," she admitted. Wonnacott is also concerned that new farmers don't see a need to be certified, noting that Vermont is about to see a huge land shift and transition between generations. "I really want beginning farmers to feel there's value in this movement," she said. "We need a really strong beginning-farmer wave to replace the pioneering farmers." It's fitting in some ways that Wonnacott is navigating a transition while also helping many of the farmers with whom she started her career navigate their own. She has co-facilitated two meetings with the old guard. "It's like deep therapy for all of us," she said with a chuckle. "These are the farmers who really inspired me. I wanted to do everything I could to make their farms and their lives successful. That drive has carried me through, and I could have done it for another 30 years." After she steps down in the spring, Wonnacott will stay involved in other ways. She's training to become an organic inspector and will do that part time. She will also help out during the pizza-oven season. But mostly, Wonnacott will focus on her health, her family — husband Harry Frank and their two grown children — and their Huntington homestead. It's no surprise, though, that Wonnacott has not stopped dreaming up new, creative ways to support her passions. "One of my favorite things to do is long-distance walking," she said, explaining that she has solo-walked trails around the world, most recently Ireland's Dingle Way. Wonnacott envisions a statewide farm-to-farm walk to raise awareness of organic agriculture and community. The Vermont walk would not be a solo endeavor, however. With her signature warm smile Wonnacott said, "I have a great vision of hundreds of people joining me to walk for the cause." The original print version of this article was headlined "Good Shepherd"